Some time ago, we got the news that Zen Studios, makers of Pinball FX 2, signed a deal with Marvel Comics to produce pinball tables for many of their top heroes. We’ve reviewed several in the past. Well the latest is available now, and it showcases the one and only Captain America. Considering this is a hero known for his improbable ricochet skill, he seems like a natural. Let’s see how he did. 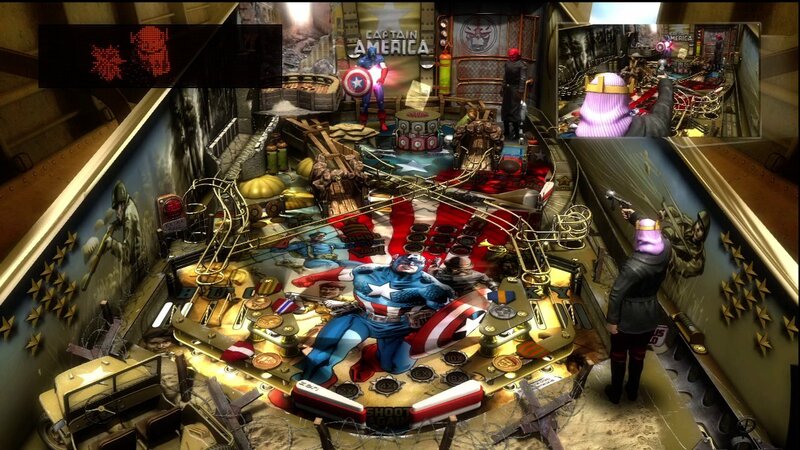 As is the case with virtually all of the Pinball FX tables, the Captain America table brushes up against photo-realism. 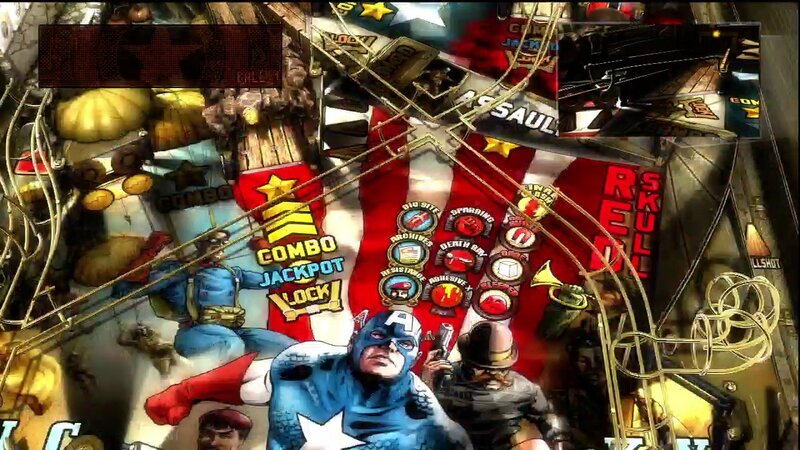 It is covered with excellent graphics, showing off a WWII theme with excellent detail. Indicators look like bullet holes, ramps look like trenches, and bumpers look like parachutes, just to name a few. The artwork is authentic to the comics, and occasional full motion graphics are displayed on the LED/VFD matrix that is a staple of physical tables. Taking all of this into account, this would easily be at home on the floor of an arcade. Baron Zemo shows up every time I lose a ball... He showed up alot. The prior tables have taught us that Zen hasn’t forgotten that this is digital, and thus isn’t limited to the sort of tricks and effects that traditional tables are. Thus, impossible effects are heaped on as well, not the least of which are the heroes and villains of the table. 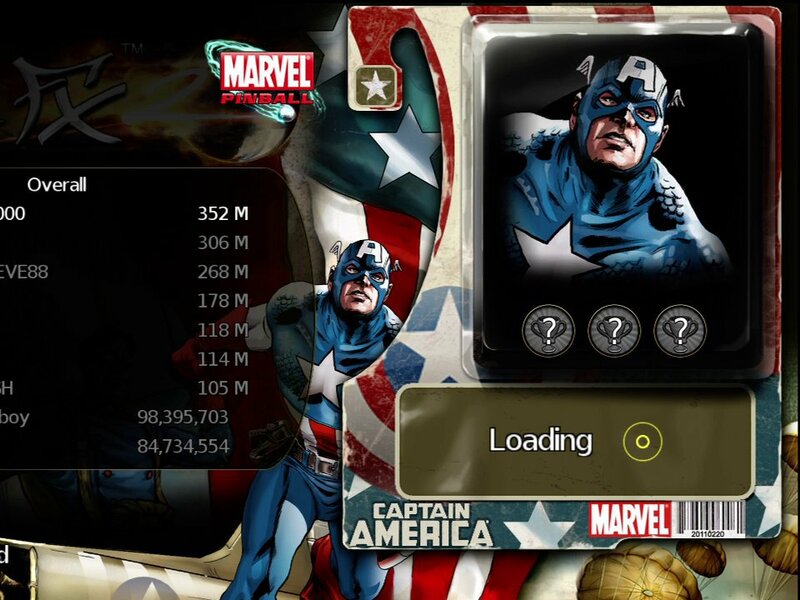 Captain America himself is always standing by, at attention when you are in normal gameplay, and locked in combat when you’ve entered challenges. If you play well enough, you’ll see him deflecting deathrays, hurling his shield, and even tangling with Red Skull with good old fashioned fisticuffs. Baron Zemo, a villain many will likely not remember, is present and authentically represented in his Cobra Commander-style facial shroud. Other effects like glowing pools of Adhesive X, make up a sort of visual garnish that keeps things interesting throughout play. The only way to combat this nefarious adhesive is by throwing my shield! 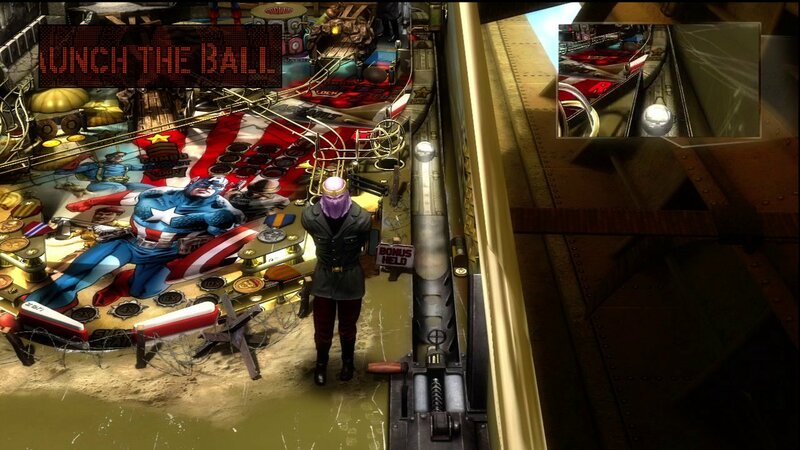 By now, I would hope you would know how a pinball game works, so I’ll just say of the standard play that it is every bit as well executed and faithful to a traditional table as everything else Zen has made. 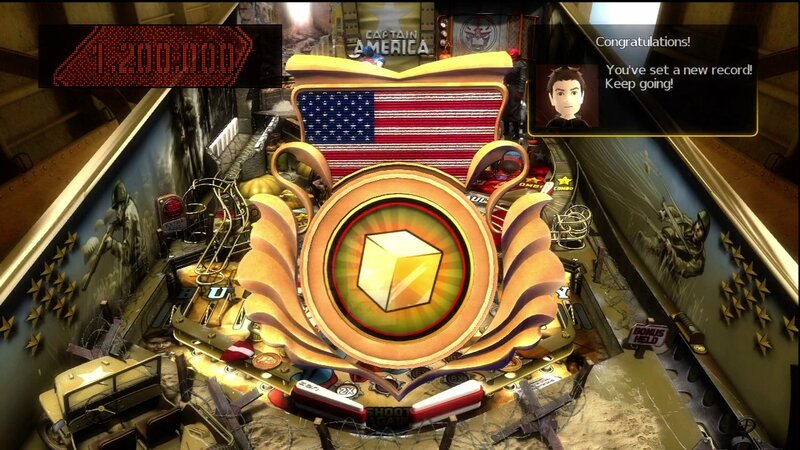 The real attraction of the Pinball FX 2 tables – and probably real tables too, if you can find them – is the bonus modes. By hitting the right locations, activating the right switches, and locking balls into the right positions, you can activate either missions or challenges. Both are played in the same way, essentially the same way ANY pinball game is played; precisely and accurately aiming the ball. Missions give you a certain goal, while challenges task you with thwarting the schemes of the villains. I had the most fun by far during these attacks. No, I can't shoot lasers out of my shield, I can only bounce them. One has Baron Zemo hitting Cap with a death ray, causing him to drop to one knee. You need to hit spinners and bumpers to help him regain strength. Once back on your feet, new targets must be hit to deflect the death ray enough times to defeat him. Another Zemo attack causes barrels of Adhesive X to start pouring onto the table. Not only does this give you a new set of targets to hit with the ball, and it actually alters play. The adhesive pools slow the ball’s travel, making hitting the right areas much much trickier. There are at least 3 missions and 3 challenges, and my meager skills only allowed me to test out 4 total. 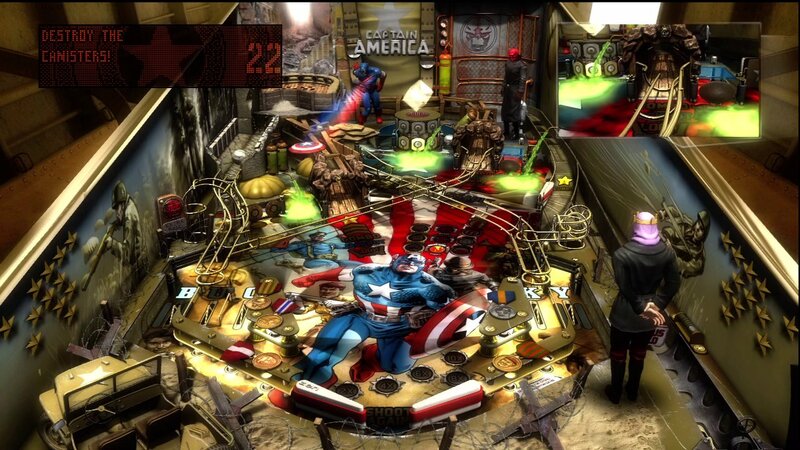 This being a pinball game, there are no levels of difficulty, so you’ll need to practice if you want to consistently unlock a fist fight with a Nazi. That and the ever-present urge to beat your high score and that of your friends should make this table last you quite a while. Once again, thanks to my poor pinball skills, Red Skull is pummeling Cap. I was actually really impressed with the sound of this table. The SFX matched the visuals extremely well. My favorite aspect of this was the gunshot sounds that were played every time the ball hit one of the bumpers. Captain America, his villains, Bucky, and his unseen allies known as the Howling Commandos all have suitably heroic of nefarious voices. And that's how the mysterious "AAA" helped Captain America get the cosmic cube. Once again, I love that there is a story to a PINBALL table. Cap and the commandos have located the castle of Baron Zemo, and they have been ordered to take them out. Rumor has it that the Red Skull will be accompanying him. It is crucial that this be done, because Red Skull possesses the cosmic cube, which gives those who can control it unlimited power. So basically, think of it as the plot of Inglorious Basterds and Aladdin combined together, with Red Skull as Hitler, the cube as the lamp, and Zemo as Jafar. I’m actually impressed that his was a straight comic adaptation, rather than trying to tie in the upcoming film, and further impressed that Zemo, who isn’t exactly widely known outside of comic circles, showed up looking as spot on accurate as he did. All I can say is that this is yet another excellent table from the folks at Zen. 8.0 / 10: A visually appealing and challenging pinball table, loaded with Captain America authenticity. Baron Zemo shows up every time I lose a ball… He showed up alot. No, I can’t shoot lasers out of my shield, I can only bounce them.